ARE you sick of religious nutters yet? I am sick of hearing that teachers in primary schools have a right to dress like something out of the Batcave. I am sick of the implication that I will be consumed by satanic lust if I gaze upon a female face. And I am sick of interviews with Aishah Azmi, the Muslim teacher suspended for wearing a veil at a Church of England school in Yorkshire because, quite frankly, I can hardly understand a bloody word she says with that black sheet over her face. And it's not just the Muslims. A Christian Bible-basher who works for British Airways is all over the news because she insists on wearing a crucifix outside her BA uniform. I am sick of her too - sick of all these people who want to rub my nose in their faith. This is the most tolerant nation on Earth and in recent times our tolerance has been pushed to breaking-point. Remove the veil. Remove the cross. Make your religion something private and personal that you share with the big man upstairs. OK, so I missed this one at the time, but the ranting religious nutter has finally been ASBO'ed from using amplification whilst anoying passers by in Oxford Circus. Homeopathy is bunkum; the time and effort are not. And there's the rub. Please, please let's use NHS money to provide more time for doctors instead of treatments we know don't work. Pickled Politics has taken the view that they should lump asian bigots into the same category as the likes of the BNP. Interesting, and very positive - "the Asian Community" is not a single entity, but is as varied as the rest of us in politics, beliefs and sexuality. Lets hope their influence spreads. Pickled Politics was created to fill a void that Rohin and I felt and knew existed. It was a magazine, a platform, where we could rail against a system that needed re-examining. Other (media) spaces remain constrained either by vested interests or political correctness. Let’s start from the beginning. We, as modern Britons, are fighting a metaphorical war on two fronts. In one corner we have what you can call “the Asian community”. On a macro level it has become a closed system dominated by community leaders, so-called representatives, “race relations experts” and self-serving politicians. They are surrounded by a community of diverse people who remain largely unwilling to examine themselves critically because they are too busy being defensive. On the other side there are the racists. But while racism has become a dirty word, even for the BNP, it has evolved into anti-immigration hysteria and Islamophobia. Like Hizb ut-Tahrir, the bigots have simply changed their words. On one side stand all the bigots who hate, despise and look down on others based on their race, religion, caste, sexuality and nationality. And there are others who choose to reject that hatred. Whose side do you want to be on? The Evolutionary Power of Religion? 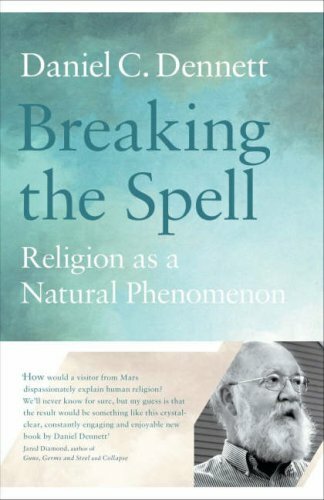 Daniel Dennett's book, Breaking the Spell examines religion, based on the knowledge that it has come about as a human phenomenon as a result of evolution. What about the evolutionary pressure exerted on man by religion? After all if you live in a society where atheists are killed, then your survival chances are enhanced if you carry genetic traits which give you a strong tendancy to either believe what you are told to believe, or at least say you do. Tuesday nights lecture by Prof Steve Jones is now available on line. It was so popular the live stream was overloaded and there were apparently around 400 people turned away on the night. Google have been censoring a video of a song called "It's in the Koran", but it's still avaliable at Little Green Footballs. Dr Wafa Sultan - a secular ex-muslim's interview on Al Jazera has brought death threats after her blunt comments - coverage in New York Times. The so called "March for Free Expression" has now become uncomfortable with Free Expression. The event has lost my support. We need a society in which the freedom of each person is compatible with the freedom of other persons. The compatibility of my freedom with yours depends on our both renouncing violence towards each other. I won't knock you down, and you won't knock me down. Karl Popper "Reflections on the theory and practice of the democratic state"
quoted in "Critical Mass" by Philip Ball. It seems that Ruth Kelley and Tony Blair are giving their fundamentalist friends the excuse to teach religious dogma in science lessons in this country. Richard Dawkins got a brief quote via phone on Radio 4 this evening. Are our police going mad, or are they being driven by a mad government? Police have ordered a shopkeeper to remove a toddlers’ T-shirt from his window display because its slogan “Winner of the Egg and Sperm Race” was deemed offensive. Tim Price, who has run the Ju-Ju clothes shop in Brighton for 11 years, said yesterday that he was stunned when officers began telling him what T-shirts he could and could not display. “Apparently, someone had found the word ‘sperm’ offensive. Is sperm a swear word?” he asked. Mr Price initially left the T-shirts in the window but covered up the offending words and replaced them with less offensive ones. The move, however, only brought another visit and another warning from the police. More than 100 Catholic priests in the Dublin region of Ireland are suspected of having abused children in the last 66 years, according to a new report. And what goes on in the other religions? Dawkins is right, religion really is a form of child abuse, in many different and cruel ways. Daniel Dennett's Breaking the Spell has finally arrived in the UK. Only 10 pages in and it is sparkling with ideas. For some people, prayer is not literally talking to God but, rather, a "symbolic" activity, a way of talking to oneself about one's deepest concerns, expressed metaphorically. It is rather like beginning a diary entry with "Dear Diary." So could we concider blogging as a religious activity, or some forms of religion as equivalent to blogging? "In the end, there is a judgement that, I think if you have faith about these things, you realise that judgement is made by other people... and if you believe in God, it's made by God as well," Mr Blair said. "When you're faced with a decision like that, some of those decisions have been very, very difficult, most of all because you know these are people's lives and, in some case, their deaths. "The only way you can take a decision like that is to do the right thing according to your conscience." So we can blame all the deaths and suffeirng on Blair's god then can we? Of course not - the man committed the evil act of war and thousands of peole died as a result. He should take the blame for his actions here and now. 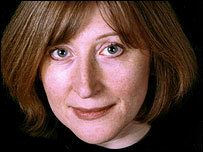 The British Humanist Association (BHA) has learned with great sadness of the death of our President, Linda Smith, who was not only a remarkable comedian and broadcaster, but also a great friend of Humanism. She had been President of the BHA since 2004. Blog of the day - Reflections of a Pakistani Atheist. I am a Pakistani Atheist; an ex-Muslim in Pakistan. I was born and raised here and hail from a fairly devout Muslim family. Like all Atheists in Pakistan – I am a closet Atheist in that most people do not know that I do not hold belief in God. Pakistan – a nation with 95% of the population being Muslim - is an indescribably intolerant place to be for a non-Muslim – and especially so for an Atheist. Dangers of coming out with one’s lack of belief range from ridicule to death threats to actually getting murdered! So how many so called devout muslims are atheists and agnostics who are too frightened to speak out for fear of their lives? For that matter, how many devout christians in the USA are atheists who live in fear? According to figures from National Centre for Social Research only a third of young people described themselves as belonging to a religion, with the majority, just over a quarter, belonging to a Christian religion. Two thirds did not regard themselves as belonging to any religion, an increase of ten percentage points in as many years (from 55 per cent in 1994 to 65 per cent in 2003). Among 18 to 24 year olds, 60 per cent said they did not belong to a religion (as did 56 per cent of 25 to 34 year olds). These findings largely reflect generational differences in religious attachment, with younger generations being both less likely than their predecessors to define themselves as religious and maintaining this distinctiveness as they themselves get older. Consequently, the proportion of people in Britain who see themselves as belonging to a religious group will continue to fall over time. Indeed, between 1994 and 2003, the proportion of adults with no religious affiliation has grown from 39 to 43 per cent. So don't believe the lies, this country is going secular, unlike the USA, where atheists are only just coming out of the closet. Also see this USA based comment on the recent Dawkins TV programme. Found via the NSS web site. The fragility of this country's democracy has been demonstrated today. An unelected body has today removed our elected mayor, Ken Livingstone, following a complaint by the British Board of Deputies. At a comment he made to a journalist from a nasty right wing newspaper who was hounding him. The newspaper in question is owned by a family which is imfamous for its historical support of British fascists and the German Nazis. That a popular democratic leader should be deposed by pressure from an unrepresentative religious organisation should ring alarm bells all round the UK. The parallels with the cartoon protests, a religious grouping protesting about an insult, are worrying. I like Ken, he's brash and says what he thinks. That is refreshing in a politician. Unlike all the members of the House of Lords, and the British Board of Deputies he has been elected by popular vote. Pickled Politics gets it spot on and Wot I Fink has more background to the comments. The voices here are quite diverse and some of Asian origin, some not. The key word is ‘progressive’. For too long has the voice of the British Asian community dominated by religious bodies or other middle-aged men who have little regard for what the younger generation, or women in general, are saying. We aim to offer an alternative voice and challenge the hegemony. Wonderful new podcast discovery - improvised German ambient electronic music. primarily it is an offer to participate! we prefer to call it a live electronic ambient project. an open circle of friends and creative people that meets several times a month to do jam sessions, parties or public gigs. what started as an electronic jam session at a bar in munich has now become a regular and well-known part of the munich music scene. improvised music, creative visuals, improvised dance and dimmed light melt into a communicative atmosphere that is unique in munich. we do not make money, we want to make music and have fun. the style "electronic ambient" serves as a musical frame. a core of sound that can be accompanied by guitar, saxophone, trumpet or other instruments. within the spheric lounge, every music is fully improvised. we do not practice or rehearse our music. every session gets recorded and the best snippets are available as mp3 for download. meanwhile we have over 200 titles online which is approximately 26 hours of music. if you want to participate you are invited to join us! with synthesizer, laptop, beamer, violin or whatever you like to bring with you. everybody brings his own equipment. if you want to contribute from a larger distance, you can help in the postproduction process, edit the raw audio-material and release songs. The god squad are scoring own goals according to this post Atheist Revolution: Religious Extremism Great Advertisement for Atheism. This post also lead me to the Freedom from Religion Foundation and their Freethought of the Day. With the self appointed Muslim Action Committee demanding curbs on free speech, it's time for us "infidels" to step up our demands for curbs on the privileges of religion. Keith Porteous Wood, Executive Director of the National Secular Society, said: "We must not allow the present controversy, which has been whipped up by religious extremists, to rush us into actions that would impose near-Islamic laws on to countries that are not Islamic. Regardless of whether such countries restrict free speech for themselves, they should not be permitted to roll out those repressive measures on to the rest of us. We will be urging the European media to reject or ignore any code of conduct that requires them to limit further what they say on legitimate matters of interest. And we will join any campaign of resistance to Islamist demands at the United Nations to restrict free expression." Support the National Secular Society in it's work to protect us from religion. A China Teapot has attracted its first blog link, appropriately enough from a meme tag. NVNC ID VIDES, NVNC NE VIDES: Survival of the Stubbornest picked up the Today is Darwin Day post and passed it on. Platitude of the Day a regular commentary on Thought for the Day. Thanks to BHA News for this gem. A good evening was had by all at the UCL Darwin lecture theatre tonight. Dr Susan Blackmore was in fine form, clearly relaxing as the audience started to join in, possibly helped by the presence of her partner Adam Hart-Davis in a wonderful harlequin suit. During the questions that followed the subject of memetic engineering came up. Richard Dawkins then put out a plea for all memetic engineers to join forces to combat religion. Cartoonist Chip Bok has entered the fray - it's great to read a cartoonist's take on the arguments. Today is the birthday of Charles Darwin, and is being celebrated as Darwin Day around the world. I'm off to see Dr Susan Blackmore give the British Humanist Association Darwin Day Lecture tomorrow, "Darwin's meme: or the origin of culture by means of natural selection" at UCL. Professor Richard Dawkins will be chairing the meeting. 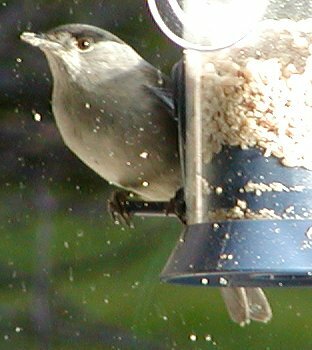 This week I saw a new visitor to our bird feeder. As far as I can tell from my 1981 Reader's Digest "Field Guide to the Birds of Britain" it is a Blackcap, and a migrating bird which has started over wintering in southern England. I've probably been introduced to Holly Near at some point in my life, but I don't remember when. I rediscovered her when I heard Roy Bailey talking about singing "I Ain't Afraid" at a festival in Canada a year or so ago. We need songs like "I Ain't Afraid" more than ever now. Whilst fundamentalist Muslim countries are calling for a boycott of Danish goods, the Freethinker is pushing the idea of a Buy Danish campaign in support of free speech, which it links to The American Thinker.